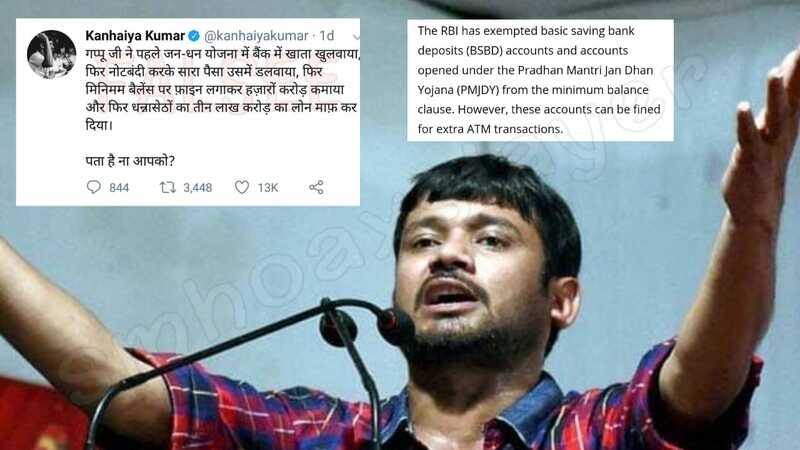 Recently a tweet was posted by Kanhaiya Kumar on 22nd January, 2019 claiming accounts opened under Jan Dhan Yojna by ‘Gappu ji’ were penalized for not maintaining minimum balance, which earned thousands of crores of rupees. The tweet, till now had been retweeted approx 3500 times. Translation: “Gappu ji firstly got the bank accounts opened under Jan Dhan Yojana, then got all the money deposited in them after announcing demonetisation, then earned crores by imposing fines on minimum balance and finally waived off the loans worth three lakh crores of the rich. You know about this right?”. Kanhaiya Kumar in his post mentions that minimum balance is required for maintaining Jan Dhan Accounts and people have to pay fines for that. What Kanhaiya Kumar has said is a false statement. While the banks in India charge money for not maintaining minimum balance in the ‘savings account’, it stands totally false for Jan Dhan Accounts. Under Jan Dhan Yojana Scheme there is no such minimum balance requirement. A tweet from SBI twitter account stands as a proof related to no minimum balance Jan Dhan Accounts. In Latest relevant post, i.e. 31st Dec 2018, India Today published an article how banks earned more by penalizing accounts for not maintaining minimum balance than Vijay Mallya or Nirav Modi loan amount. But they also specifically mentioned that Jan Dhan Yojna accounts are exempted from this penalty. “The RBI has exempted basic saving bank deposits (BSBD) accounts and accounts opened under the Pradhan Mantri Jan Dhan Yojana (PMJDY) from the minimum balance clause. However, these accounts can be fined for extra ATM transactions. ← Here is the answer to Mr. Amit Shah’s doubt raised on opponents. ‘Inception’ wasn’t a Sci-Fi !